We watched them all so you don’t have to. Below is a series of the best videos we have found of the Wolf Creek Ski Area from January – March 2011. Helmut cams are even more prominent this year giving the viewer a sense that they are along for the ride. Bookmark this post for those emergency moments when your stuck at the office or a hot day in July. Be sure to watch in full screen if you can get away it and check out my blog video viewing tips if your an internet video novice. You can view even more of these videos on my YouTube channel as well. From Will Hurtgen and Vimeo: This is one of our favorites from this year especially at 1:20 as Will holds the video camera on a pole and films himself in the powder. YouTube’s cjdolan247 posted this helmet cam video of some sweet downhill. Here’s another one from cjdolan247 which really captures the snow covered trees and beautiful blue sky. Bert Middleton of Powder Skiing Colorado talks about skiing Wolf Creek in the 80’s and the changes since then. We always like the videos where people film themselves on their way to Pagosa Springs. This video features AlexanderOleynik and his friends on a trip to Wolf Creek from Houston, TX. Who doesn’t love to see a 2-year old on a snowboard? Another one of our favorites thanks to YouTube’s macintoshkid. Love the camera angles on the chairs and such. Here’s a quick video showing a snowboarder racing downhill from xmctech. Quick downhill snowboarding video featuring crisp, blue skies from YouTuber sidscheer1. Fun family video showcasing the Foster’s visit to Wolf Creek featuring live video and photos. I’ve got about 20 more of these videos on my YouTube channel or you can scroll through the playlist below. 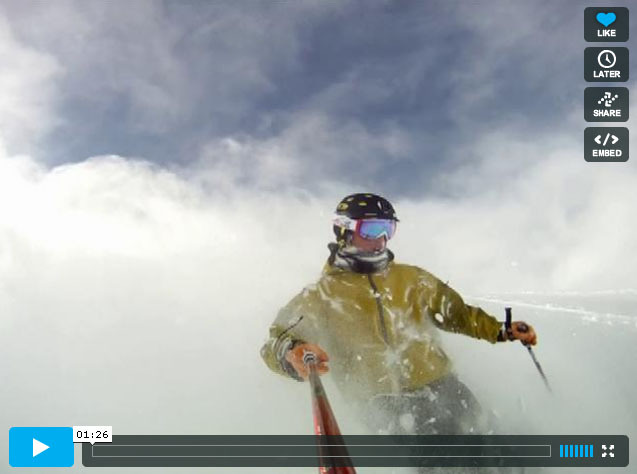 the video of Wolf Creek ski area brought back some old memories. I lived in Pagosa from 1984-1998 & snowmobiled A LOT of the area around Pagosa. One day , I took off (by myself = dumb) from a small pull-off on the west side of the pass. After following a trail for a while – I took off & kept climbing higher , going back & forth. I finally stopped at one point on the side of a hill – below a high point a little ways – & saw some movement up towards the top of the hill. I wondered what animal,etc was way up here? After moving up a little closer, I realized that it was people getting off of the (initial) ski lift ! I had snowmobiled all the way up the (back) west side of the ski area. -WHOA –NEAT ! Wow. Great story, Ron. Thanks for commenting. Feel free to comment as often as you like.